Why Grow Tomatoes in Containers? This is the first year that I am growing the majority of my tomatoes in containers, and wow, are they doing well! I decided to go with containers because I’m using my raised beds for a cutting garden, and I’ve found that growing tomatoes in my regular garden beds results in slow growth and late-season diseases. I planted one tomato in the ground and it is definitely lagging behind the guys in the containers. An 18-inch container may be a little tight, but most tomatoes do well in 18- to 24-inch containers. 1. You control the soil. For my container tomatoes, I used large containers and a high-quality potting mix. The mix has most of what the tomatoes need in terms of nutrients and I will add some bone meal or liquid fish emulsion as the tomatoes produce fruit to keep the calcium and fertility levels up. The potting soil also lacks all the soil-borne diseases that tend to hang out in the ground—that’s a good thing! 2. Decent drainage. We’ve had a pretty wet early summer in Minnesota. (We had a solid 3 inches in the past week and many areas of Minnesota had much more.) Unlike the ground, which can get water-logged, containers drain well. (I’m considering adding pot feet to my containers to ensure even better drainage.) They have holes in the bottom so excess moisture moves away from the roots, preventing root rot. One disadvantage of container tomatoes is that in dry spells you have to stay on top of watering. Tomatoes need consistent—but not excessive—moisture throughout the growing season to perform best and avoid blossom end rot. 3. Air circulation, easily. Every time I plant tomatoes in the ground, I end up putting them too close together. They look so little when they go in the garden and it’s hard to imagine how big they will get — and how entwined in each other. With tomatoes in pots, I can move the pots if they get bigger than expected and start encroaching on their neighbors. Air circulation is another important factor in the health of tomatoes. 4. Easy to cage. The pots I chose for my tomatoes are all 18 inches in diameter. 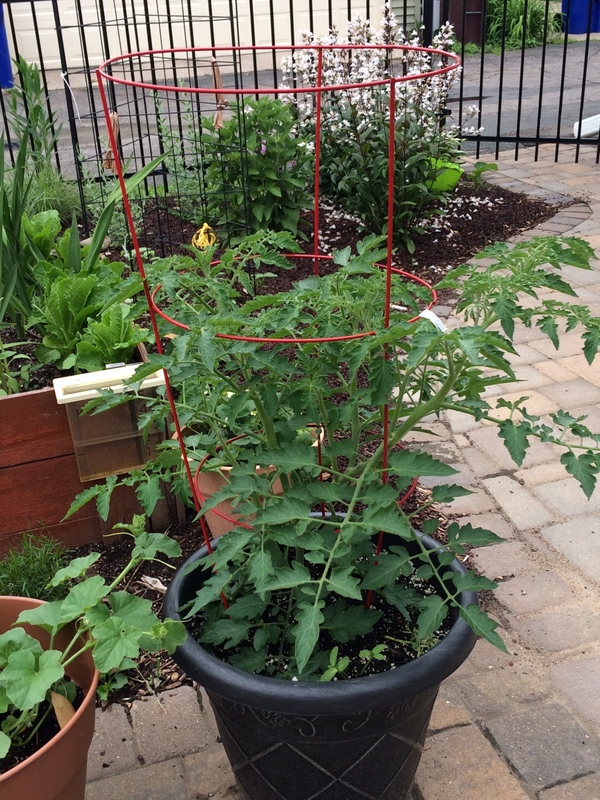 For really large tomatoes, you could go even bigger, but the 18-inch pots are a perfect fit for the standard size tomato cage, which I put on the tomatoes a few days after planting. Don’t wait to cage your tomatoes. Green tomatoes already on some of the plants! 5) Easy to pick. 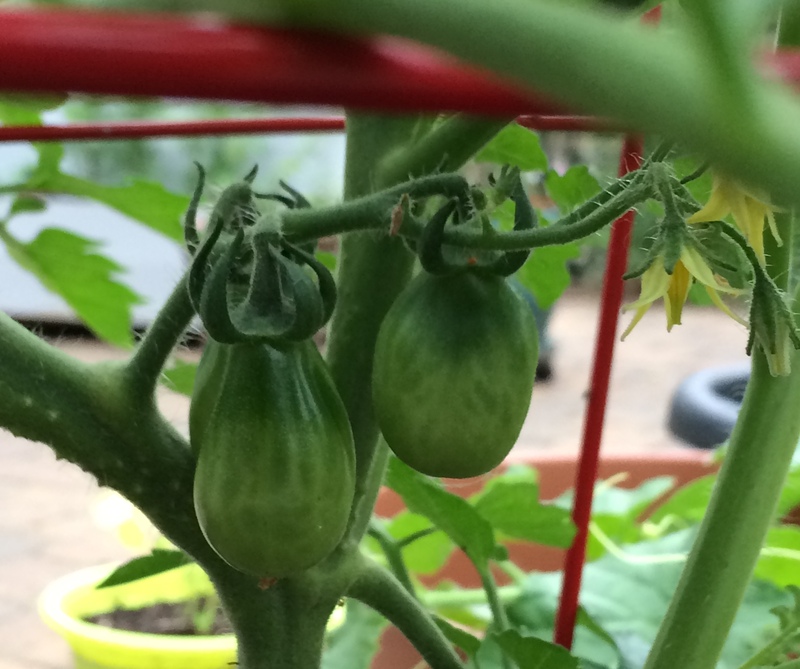 Container tomatoes are elevated by the height of the pot so it’s easy to see when fruit is ripe. The elevation also makes it harder for rabbits and voles (though unfortunately, not squirrels) to get at the tomatoes. For squirrels — a bit more engineering may be necessary. Many of the usual instructions for growing tomatoes apply to container tomatoes — place them in a very sunny spot, plant them deeply in the container to allow roots to form, and pinch extraneous foliage to keep the plant focused on producing fruit. Generally, determinate tomatoes are recommended for container growing, though I’m growing several types of heirloom tomatoes and I think most of them are indeterminate. I will report how things go as the season progresses! Do you grow tomatoes in containers? I do! And consider it very convenient. Because I have so little suitable space in my wet urban garden I am planting my tomatoes in Smart Pots (big ones) which are located right by my back door. They are just starting to ripen and it is great to pick a little cherry tomato when I walk by. I also use good potting soil and occasionally some soluble fertilizer. Still mostly green tomatoes here, but so far the containers are working well! I did add a little fertilizer because we have had so much rain.